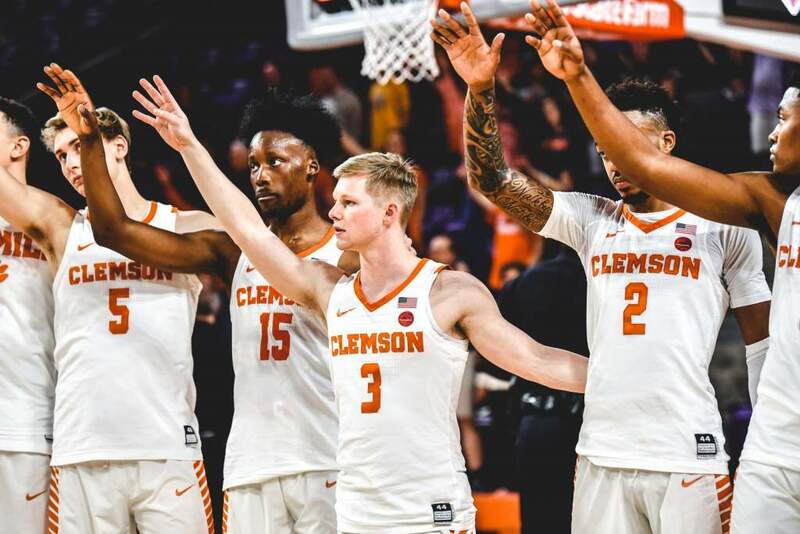 COLUMBIA, S.C. — In a thriller that saw neither team lead by more than four points the entire 40 minutes, Clemson prevailed over No. 20 South Carolina in the end by a score of 62-60 in front of 17,026 fans at Colonial Life Arena. The win was the first in Clemson history on the road against a top-25 non-conference opponent. Both teams are now 9-2 on the season. Jaron Blossomgame produced a double-double with 15 points and 10 rebounds, while sophomores Marcquise Reed (14) and Elijah Thomas (12) came up big for Brad Brownell’s team. A rough and tumble first half played out, as neither team took an advantage of more than four points on the scoreboard. Clemson gained a 15-12 lead after Donte Grantham hit consecutive three-pointers. Thomas then came on, connecting on three straight field goals in 90 seconds to push the Tigers ahead 21-17. After Blossomgame scored on a soft turnaround jumper with 17 seconds to go, the senior blocked a Gamecock attempt on the other end to preserve a 29-25 lead at halftime. The second half saw foul trouble continue to mount for the Tigers, who put South Carolina in the double bonus with 9:40 left in the contest. Blossomgame had a driving dunk on the baseline with 6:28 to play to put Clemson up 47-46, but he was whistled for a quick technical foul for hanging on the rim. Moments later, Reed scored a basket to put the Tigers ahead by two. But South Carolina would not go away, as the Gamecocks took advantage from the free throw line in the second half, converting 13 of 17 attempts after intermission. Chris Silva hit three late and PJ Dozier — who led all scorers with 26 points — hit a layup to put SC back on top 54-50 with 4:07 left. Still up three with under 90 seconds left, Blossomgame scored on a tip-in to pull his team within one. Reed was fouled the next Tiger possession and calmly sank two go-ahead free throws. 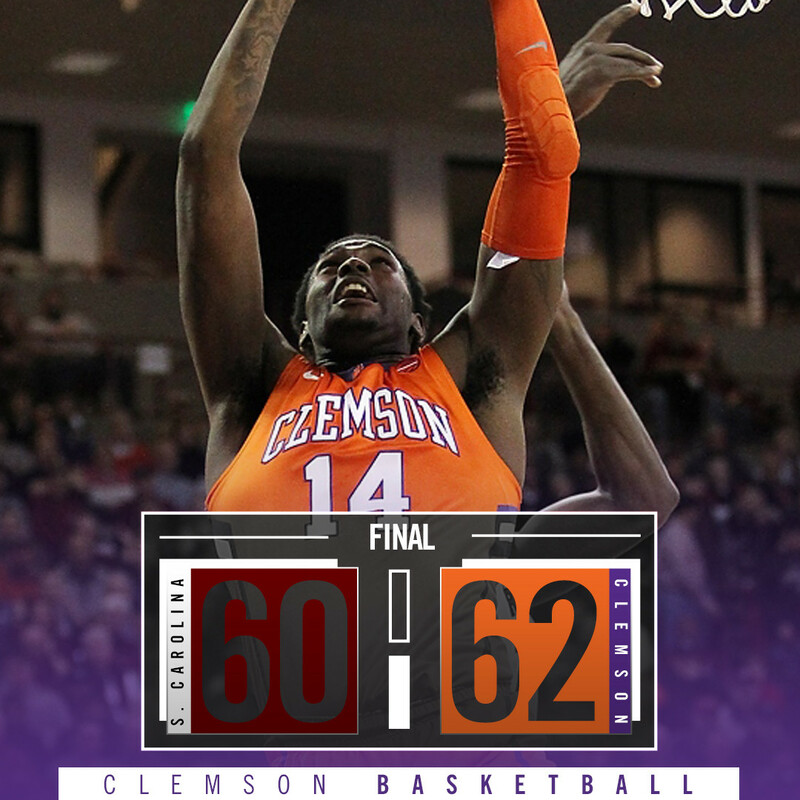 Clemson never trailed after that, as senior Avry Holmes converted three of four at the line to preserve the win. Holmes contested Dozier’s game-winning three-point attempt well, and Grantham collected the rebound as time expired. Clemson’s defense held Carolina to just 36 percent shooting, including a woeful 2-16 from three. The Tigers also forced 14 turnovers and outrebounded the Gamecocks by a 36-35 margin. The Tigers break for Christmas before returning to action at home against UNC Wilmington at 7 p.m. on December 28 at Littlejohn Coliseum.